* Input power can be configured up to this value. Input power is highly dependent on the voltage of the power source and may vary greatly depending on the type of power source/battery used. Generally, a fully charged battery pack with a low internal resistance (high C discharge capable) or a high-power bench power supply is required to reach peak values. Input power is not mechanical output power. This drive unit package is built to order and has very limited availability. There can be an extended lead time for this product. Please contact us with any questions about this product or its availability. Orders are processed in the order payments are received. Contact us with any questions about this product or its availability. The SPORT PLUS Tesla Drive Unit package starts off as a normal Performance unit. 057 Technology then checks all aspects of the motor and power electronics to ensure reliability with heightened specifications. Units which pass our examinations then qualify to be modified for greatly improved performance. This package has a peak power to weight ratio of over 2.18 HP per pound, and a whopping 650 Nm of torque. Top speed is also improved significantly to a new maximum of 17,000 RPMs. If you want the absolute best performance drive unit package available, then this is the one for you. This package is born from 057 Technology's unmatched knowledge and experience with Tesla components, so you won't find these units available anywhere else. 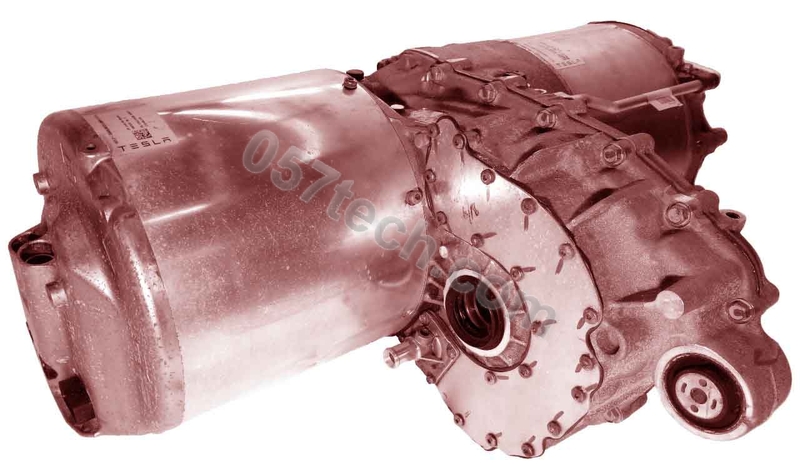 All Tesla Drive Unit packages offered here are complete systems that include a three phase AC Induction Motor, a High Voltage DC to AC Inverter, and a Differential—all in a single package. They are recycled from Tesla vehicles that have been involved in collisions where the vehicle has been sold at auction as a total loss. Once acquired, they are then refurbished, reprogrammed, and fully tested in-house. 057 Technology has developed proprietary control systems for all variants of the Tesla Drive Units. This controller is included with all Tesla Drive Unit packages purchased from us and is not sold separately. We do not sell controllers for use with Tesla drive units acquired by third parties. 057 Technology's Drive Unit control system has been designed and built from the ground up using high quality automotive grade components. It is not based on low quality or hobbyist hardware (such as the Ardunio) that is in no way suitable for use in a safety-critical system in an automotive environment. When performance is critical, you need a well validated design that is right for the job. No corners are cut when it comes to hardware from 057 Technology. Every Drive Unit controller is fully tested in-house to ensure it meets all specifications so that you can trust that our systems will perform appropriately and safely. We have put in the time and research needed to ensure that Drive Unit packages from us will perform as well or better than they would have in their original vehicle. We have full control over all variants of the Tesla Drive Unit. We are also not limited by the Drive Unit's build date or software version in any way. Additionally, full features are available—including cruise control capability. No safety or performance compromises have been made with our design. We have kept our products in development for a long time to be sure we were satisfied that everything functioned perfectly and safely. As a result, with our products, you get the full functionality you deserve from these amazing devices. Click here for more detailed information and specifications about the 057 Technology Drive Unit Controller. The Tesla Drive Unit itself is a recycled and refurbished component. This component is thoroughly tested prior to shipping to ensure quality. However, as these are recycled units, we only provides a basic warranty against DoA (dead-on-arrival) for the drive unit itself, which excludes any shipping or handling related damage. 057 Technology's Drive Unit Controller is warrantied for a period of one year against failure that is not the result of improper usage, physical damage, etc. Warranty replacements will be at our sole discretion upon return and inspection of the controller. No refunds or returns are accepted for this product. Orders may only be canceled prior to shipment. Shipping can be arranged by to nearly anywhere in the world. Shipping and handling costs separate. Alternatively, the buyer may pick up the product from our facility in Hickory, NC, USA or arrange for pick up by a carrier on their own. We are not responsible for any damage incurred after the product leaves our facilities. The buyer may purchase insurance on the shipment from the shipper at their discretion. Note: Drive units are sold by HSR Motors.